He&apos;s not allowed to officially sign until Tuesday but (assuming there isn&apos;t some monumental screw-up by the Dolphins), All-Pro defensive tackle Ndamukong Suh should be plugging the middle of Miami&apos;s defense for years to come. The two sides have come to a not-quite-yet-official six-year/$114 million dollar agreement for Ndamukong to take his talents to South Beach. $60 million of those dollars will be guaranteed. Detroit opted to let Suh test free agency after opting not to sign him to a pricey one-year franchise tag. If the contract with Miami holds it&apos;ll be the biggest ever for an NFL defender, surpassing the six-year/$100 million dollar deal J.J. Watt signed with the Texans last season. In five seasons in Motown, Suh made four Pro Bowls and was also a four-time All-Pro first teamer. Last season he made 53 tackles and compiled 8.5 sacks. He added two more sacks in the Lions&apos; lone playoff game, a loss to Dallas back in January. 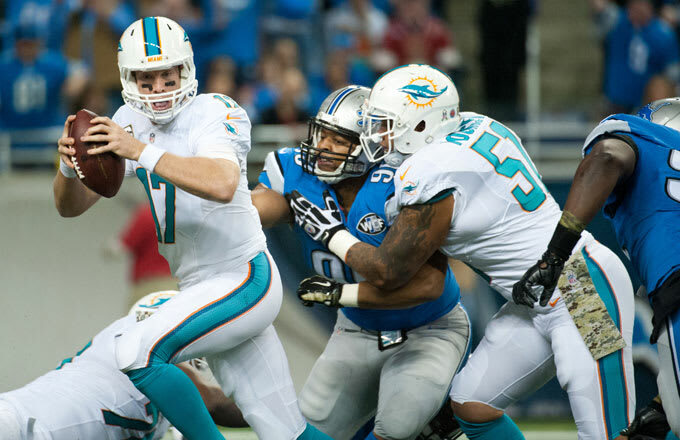 Since being drafted second overall in 2010, Suh leads all NFL defensive tackles with 36 sacks. Suh has also stayed remarkably healthy in a brutal league. In his five seasons he&apos;s only missed two games. Both of those were due to suspensions.